Share your love with our "I Love You" pressed penny. 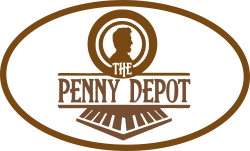 Give this penny to someone special, slip it into a greeting card, or use it as a party favor. A simple way to show how much someone means to you. my hubby and i always collect pressed pennies everywhere we go, it was his birthday so i purchased the happy birthday pressed penny and this i love you one and fell in love with both, so did he.the perfect addition to our penny passport! the packaging was wonderful and very thoughtful, thank yous' everywhere! will definitely be purchasing again!! THANK YOU SO MUCH!